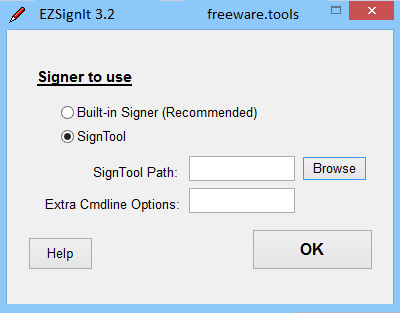 The SignTool alternative, EZSignIt is a redistributable code signing program that operates either from a simple GUI interface or command-line. Unlike other programs, it does NOT require Microsoft's SignTool (signtool.exe) although it can optionally use it if you'd like. It supports SHA-256 and dual-signing, can sign multiple files at once, remembers your last used settings, and can automatically back up files before signing for auto-restore in case signing fails. Comes with full help and guidance. Code signing is MUCH easier with EZSignIt. In other words, you can digitally sign applications and other types of files without depending on Microsoft's SignTool. While many developers may not give it too much thought, the truth is that code signing helps users determine the application's authenticity and integrity. Not only does it stand as proof that you are looking at a trustworthy app, but it can also provide some guarantee that the code has not been tampered with since it was signed. EZSignIt is a lightweight application that allows you to apply your digital signature on the source code or executable file so you can enhance their integrity. Following a quick installation, you are welcomed by a minimalistic, yet clean and intuitive interface that should not give you any challenges. You can sign a file by specifying a few details, namely the file that you want to sign, an optional description for it, the certificate file name, its password, in case it is protected by one and the type of signing algorithm. It is important to note that the utility can create backups for the files you are signing by default and if they are under 100 MB. Moreover, you should know that if the file was already signed, then the app replaces automatically replaces the original signature. The signatures cannot be removed from the files, so remember to create your own backups. You should know that the program supports three types of signers, namely SignTool, it's own built-in utensil and CAPICOM. The latter option is not visible in the UI, but you can access it from the command line console and make sure you have the adequate DLL file installed on your computer. The tool supports SHA-1, SHA-256 as well as dual signing and allows you to sign multiple files at the same time. As far as the built-in signer is concerned, it employs all the settings the tool is capable and makes use of the same underlying mechanism as SignTool. In case you want to use the Microsoft signer, then you need to download the Windows SDK and specify the path to signtool.exe. If you care about maintaining a good business reputation among your customers and you want to preserve intellectual property, EZSignIt is a handy application that can help you attest the authenticity of the application, code or file.